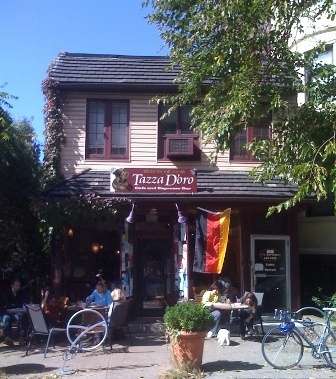 Why is Tazza D’Oro Flying the German Flag this Weekend? I could probably count on one hand the biggest influences in my life – 1979-1980 was one of those years. During my high school days, my family and the town I grew up in were passionately involved in the AFS organization. The AFS, American Field Service, was responsible for a student exchange program where U.S. high school students would live abroad for a year and foreign students would live in the U.S. for a year. During the summers, my family hosted students from Italy, Ecuador, Korea, and France. We had such an awesome experience, my parents thought it would be a good idea to host a student for a year. After a rigorous application and interview process and the passing of several months, we received a huge packet in the mail. The packet included a “we pass as a host family letter” and a bunch of info and a very small picture of a young teen from Germany who the AFS matched with our family – Thorsten Moritz. I don’t remember much about the packet except the picture, looking up in the encyclopedia (yea, no Internet, dudes) where the heck was the Black Forest in Germany. I can remember being so totally excited and my parents having serious discussions about taking care of a kid from another country – transitioning into a new culture and family, his safety, well-being, preparing German food, language – Thorsten knew some English we didn’t know any German – and providing him with a good experience, including travel. In August of 1979, our family traveled to Pittsburgh to pick up Thorsten. It was an amazing year and an amazing experience that I think influenced many parts of my life; including my vision for Tazza D’Oro. Culturally, as teens, we were worlds apart but after many meaningful discussions I came to understand that Thorsten and I had more in common and we were very similar- family, peers, school, coming of age etc. Thorsten transitioned into our family and school. 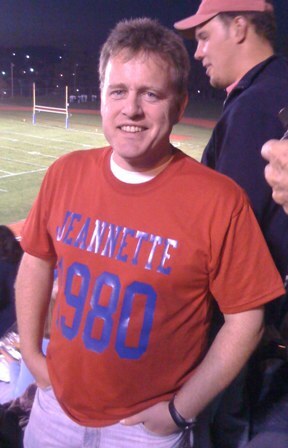 He became the star kicker of our high school team,the Jeannette Jayhawks – keep in mind this was a kid who never experienced American football or ever saw a football! Over the last 28 years Thorsten and my family have kept in touch. The connection has been so great that when we get together, like we did this weekend, it seems just like “family”. Thorsten, his wife Ute and 2 children live in St Paul, Mn. where Thorsten is a professor at Bethal Seminary. Thorsten, you have taught me that many of us have different perspectives, experiences and opinions but when we can connect on a deep, meaningful level we are not that different. It is with this perspective that I have built my vision for Tazza D’Oro. BTW kiddo, saying goodbye 28 years later hasn’t gotten any easier either! it was so awesome to meet thorsten and trade stories of english people and their fear of germans. he was pretty cool. amy,did you learn your sarcasm from him?